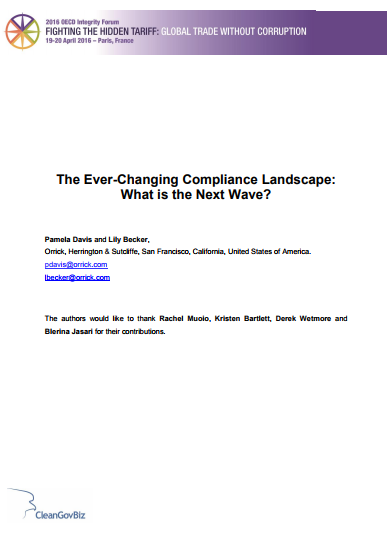 Resource Centre > Uncategorized > The Ever-Changing Compliance Landscape: What is the Next Wave? string(1137) "Resource Centre > Uncategorized > The Ever-Changing Compliance Landscape: What is the Next Wave?" The Ever-Changing Compliance Landscape: What is the Next Wave? In today’s global economy, multinational companies face a complex and ever-evolving legal environment. Compliance functions must continually adapt to address these challenges and be in front of the next wave of enforcement actions around the globe. This article explores the historical cycle of development of several laws in select jurisdictions, which have recently had an increasing focus upon the need for preventative measures and strong compliance structures. The ultimate question: will the laws of a few jurisdictions become a global standard? Historical cycles suggest that when one larger or more influential jurisdiction begins to focus on a new issue, others will follow. This article discusses what may be the next wave of mandatory compliance enhancements: supply chain integrity laws, which require companies to evaluate their supply chain to address a myriad of risks, including trafficking, child labor, and slavery. The difficulties in developing a program are many, but the need for vigilance is great; with respect to just the concerns regarding human trafficking, it is estimated that nearly 21 million people around the world are victims of human trafficking (Int’l Labour Organization 2015, p. 5; U.S. Department of State Trafficking in Persons Report 2015, p. 7). The paper explores the progression of two other areas of the law: antitrust and anti-corruption as potential predictors for how new legislation and ultimately compliance requirements within the supply chain context may emerge. Finally, the paper offers an overview of why robust compliance functions are critical and standard for antitrust and anti-corruption issues and whether supply chain integrity compliance programs focusing on human trafficking risks are the next wave.